in water. 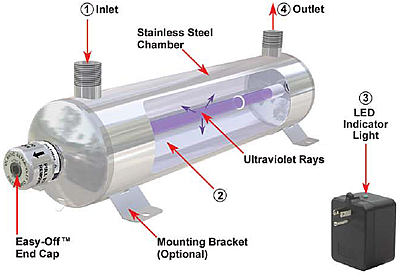 Economical and safe, the Minipure® Ultraviolet Purifier offers rapid water treatment without the use of heat or dangerous chemicals - often for the lowest cost available by any means. 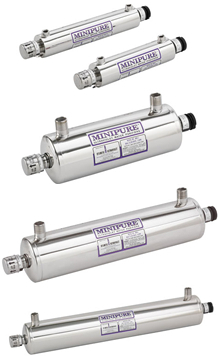 Minipure® ultraviolet water purifiers produce 1 to 9 gallons per minute of purified drinking water. Chamber and hardware are Type 304 stainless steel for dependable long life. Chamber is electropolished and passivated for an attractive finish and dependable service. LED on transformer provides visual indication of germicidal lamp operation. replacement without shut down of water pressure or drainage of tank. Insures optimum lamp output at normal potable water temperature.